In recent years, intense abstraction of groundwater has led to depletion in groundwater storage (GWS) in India, the second most populous country in the world. 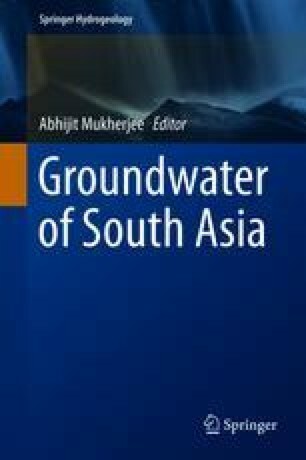 In this chapter, we demonstrate our work on estimating groundwater storage over India by using data from the Gravity Recovery and Climate Experiment (GRACE) satellite mission to study long-term (2003–2014) change in GWS over India. Rapid depletion of GWS is observed in the Indus–Ganges River basin in the northern and eastern parts of the Indian subcontinent at rates of about −1.25 ± 0.14 (−12.56 ± 1.37 km3/year) and −1.05 ± 0.35 cm/year (−13.12 ± 4.36 km3/year), respectively. The fertile alluvial plains of this semiarid basin support huge areas of irrigated agriculture, leading to depletion of GWS. On the other hand, the southern and western parts exhibit groundwater replenishment. SNB acknowledges CSIR (Government of India) for their support for providing the SPM fellowship. GRACE land data were processed by Sean Swenson, supported by the NASA MEaSUREs Program, and are available at http://grace.jpl.nasa.gov. The GLDAS data used in this study were acquired as part of the mission of NASA’s Earth Science Division and archived and distributed by the Goddard Earth Sciences (GES) Data and Information Services Center (DISC). The ERA-Interim data were obtained from the ECMWF data distribution portal http://apps.ecmwf.int/datasets/. SNB thanks Dr. S. Verma for her advice.